Justice and Mercy | Words of Wisdom? In front of the Cumberland School of Law at Samford University in Birmingham, Alabama there is a statue of Justice and Mercy. Justice is blindfolded and the scales she holds are perfectly balanced. The angel, Mercy, is whispering in Justice’s ear. Perhaps Mercy is reminding Justice to hold compassion and kindness in mind as she administers her wares. 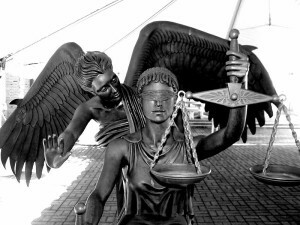 Perhaps many in America would like to think this image of Justice as blind, unbiased, and perfectly balanced represents what we offer in our justice system. However, this statue fails to portray an important ingredient in our system: human failure … we fail all the time. We fail to be unbiased, perfectly balanced in our opinions, and infallible in our judgment. Our system of justice too often looks like a system of vengeance and revenge. Too often we fail to provide the nurturing soil for redemption, reform, and recovery. In his book, Just Mercy, Bryan Stevenson shares many compelling stories about the failure of our justice system. He and his organization, the Equal Justice Initiative, have documented dozens of cases in which people condemned to death have been exonerated, proven innocent, of all charges. EJI has worked diligently to change sentencing mandates for juveniles so no more children will be put to death or spend the rest of their lives in prison … many of whom committed non-violent or non-homicidal crimes. Often what is missing in our system is compassion and humility. The phrase, “there but for the grace of God go I” is missing in our service to justice. Adlai Stevenson is quoted to say, “A hungry man is not a free man.” Many unlawful acts are acts of desperation. Desperation comes out of a sense of having few, if any, choices. Who among us would not do anything … anything … to feed our hungry child? What are we doing to reduce the sense of desperation in our society? How are we responding to those who need a step up so they can stand on their own? How do we provide more choices for people? How are we empowering the voices of the hungry, the poor, the oppressed? In his TED Talk,* Nick Hanauer, a self-described plutocrat and gazillionaire, speaks to the danger the economic imbalance in our country. He warns that a revolution will be coming if this is not corrected soon … and, he makes the case for how bad this disparity is for business. He is a strong proponent for increasing the minimum wage to at least $15 per hour so that more people are financially stable, and able to keep the gazillionaires in business. When the working poor need to supplement their income with public subsidies, no one wins. This is just one way we can make a difference. It takes a lot of humility, love and compassion to create a truly just system that makes both victims and perpetrators more whole. The world is full of fear, lots of fear. Where there is fear, love is suffocated. We need humility, love, kindness and compassion (aka Mercy) to guide us toward building the Beloved Community we dream about. This entry was posted in Justice and tagged compassion, EJI, Hanauer, Humility, justice, Mercy, Stevenson, TED, UU 1st Principle, UU 2nd Principle. Bookmark the permalink.